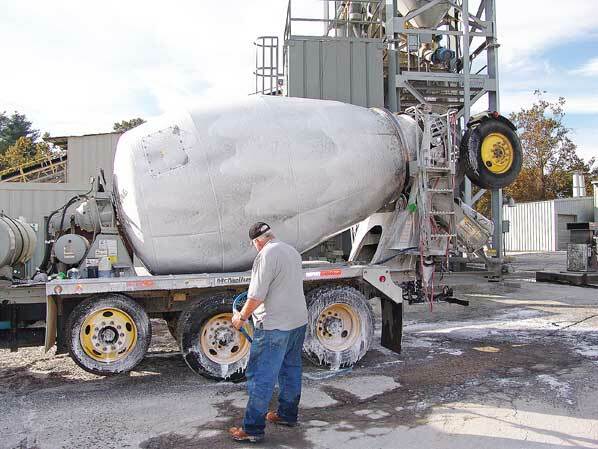 Keeping your concrete truck clean is a top priority for truck drivers and owners of concrete manufacturing plants. The cleanliness of your trucks say a lot about your company, regardless of the quality of the product you produce. A dirty cement truck can leave potential customers with a bad impression of who you are and what you stand for. Luckily, there is a company that provides truck-cleaning products that will have you looking your best while you’re on the road. Mortarman Safe Soap with Wax™ is a concrete truck wash and cab wash that works wonders on your vehicle’s exterior. This biodegradable soap contains a wax that helps maintain the beautiful gloss and shine of the painted areas and finishes of your cement truck without causing damage. It also reduces the chalkiness that is present with other finishes. This biodegradable product will remove road film, cement and light-concrete residues from the exterior of your concrete truck. It is a non-corrosive and safe on all finishes. Additionally, the wax acts as a release agent for cement so that with regular use, your trucks will become easier to clean. Mortarman Safe Soap II™ may be used straight one-to-one or diluted. Apply the soap with a generic sprayer or, for best results, utilize the foaming applicator from Fortrans. Fortrans, Inc. also sells aluminum cleaner and concrete remover for concrete trucks. Contact our team today to place an order or to ask any questions you have about the products.